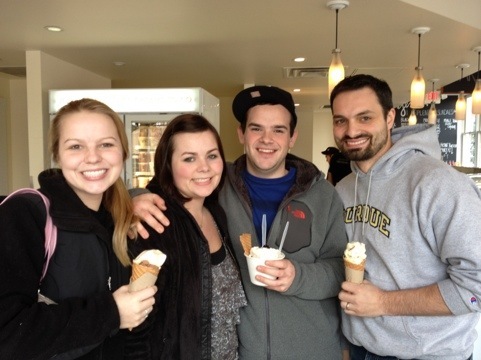 We’re on the way home from Carmel and we stopped, of course, at Jeni’s in Dublin. Having some first-timers with us this time made it even more fun. After pointing them out to the handlebar-mustached young guy behind the counter, they were handed samples of Salty Caramel, the most popular flavor. We all sampled various flavored and made our selections. The added peanuts, caramel sauce, banana and whipped cream help to tone it down. You even get a fortune cookie! My only regrets: not ‘trying’ Salty Caramel’ and ‘Wildberry Lavender.’ I know what they taste like, but no trip to Jeni’s seems complete without them. I CORRECTLY predicted that the newbies would be boring and stick to ‘plain’ favors. Indeed, Abigail got a vanilla and chocolate cone, and Carolyn and Ben shared a ‘Mock Turtle’ sundae, which features vanilla with pecans and caramel and chocolate sauces. At least they liked them. Andrew got a favorite, Whiskey and Pecans, in a fresh-made cone. 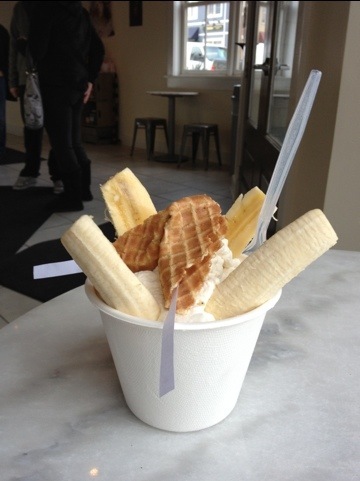 Posted on January 4, 2012 February 27, 2016 by thehealthypineapplePosted in #fabfood, TravelTagged Family, Ice Cream, jeni's, Ohio. 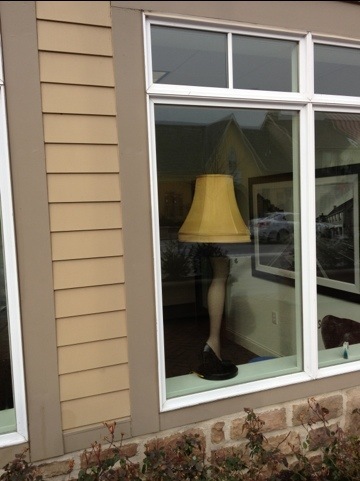 I would wear the lampshade if could have real legs like that one in the window!!! The cones and sundae look scrumptious!